OOO Aquatron-BKhK offershigh-quality waterproofing compound AQUATRON-8. 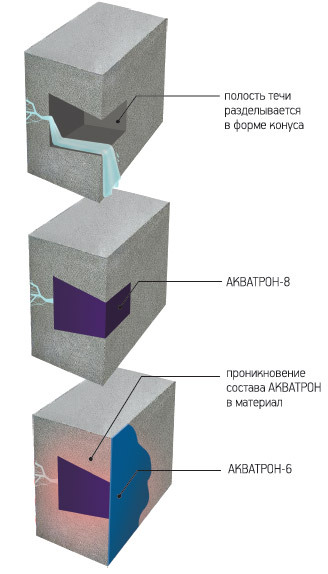 Advanced unique product will quickly eliminate local leaks in the stone and concrete structures. The compound is notable for its fast action; it fastens within 30 seconds to12 minutes (the time is adjusted by the customer at its own discretion). The material is easy to use, durable, resistant to water and other liquids, contains no toxic substances. It is used for waterproofing of active leaks of liquid media in case of cracks, cleavages, and treatment of pipe joints, wall panels, bolting of foundation screws into reinforced concrete, brick, and concrete surfaces. It is widely used for the repair of mines and pump stations, water storage tanks, sewage collectors, and swimming pools. It is often used as a water sealing material for different types of wells. AQUATRON-8 is made based on aluminous cement and calcium aluminate hydrate supplemented by special activating chemical additives. After the treatment of a seam or a crack the leak is blocked within a short tune by the water sealing for a well and other structures; it ensures lack of further leaks. The compound has a penetrating effect. After applying the compound, to ensure the result the surface should be treated with AQUATRON-6 compound. Application of waterproofing compound to eliminate active leaks: 1. Prepare the required amount of the sealant and mold it by hands. 2. Fill the prepared hole and press firmly with a spatula or hand. Keepinthispositionfor 0.5-1.5 minutes. 3. Remove the excess of the compound as soon as possible. The material is fit for use due to its ability to fasten quickly and high adhesion properties. After curing, the compound expands and thickens, thus forming dense filler on structures with active leaks. The unique features of AQUATRON-8 enable its use even under water. Where to buy the system for water sealing of leaks? Fast order processing and delivery of large batches to the specified address. Purchase domestic proprietary compounds at factory prices. Note: the use of waterproofing compound for structures in contact with aggressive media shall be discussed and agreed with the manufacturer.